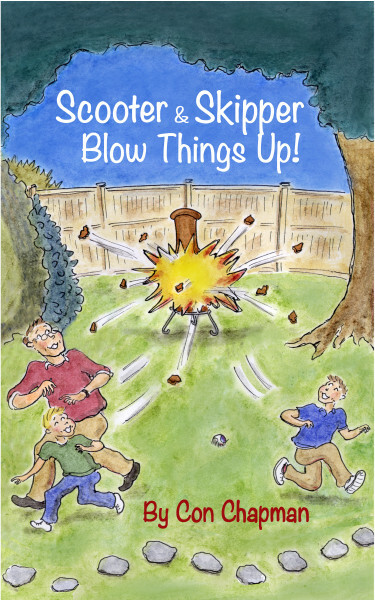 HOPress is proud to announce the official launch day of Scooter & Skippy Blow Things Up! by Con Chapman. We wanted to introduce you to this multi-published author, humorist and playwright. Scooter & Skippy Blow Things Up! is available on Amazon.com in paperback and kindle. Tell us about Con Chapman – where did you grow up, profession, family life etc. I grew up in a small town in Missouri, and started writing my junior year in high school. In my first job after college I was a newspaper reporter in Worcester, Mass. and was a miserable failure at it. I found I wasn’t good at asking embarrassing questions of total strangers, so I took what someone once called the route of the intellectual hobo followed by failed writers and became a lawyer. After fifteen years of writing nothing but legal articles I decided to write a book about the most famous failure in Boston Red Sox history, the late-season collapse in 1978 when they blew a fourteen-game lead and lost the AL East race to the Yankees in a one-game playoff when a light-hitting shortstop named Bucky Dent hit a three-run home run. I self-published it, but it was a minor success, and I’ve been writing in my spare time ever since. What inspired you to write Scooter & Skipper Blow Things Up! ? The inspiration was my allergic reaction to most Dad Humor–guys writing affectionately but tongue-in-cheek about their mischievious offspring. It’s a genre that generally suffers from excessive sentimentality, and Scooter & Skipper is intended in part as a parody of Dad Humor. You have written plays, short stories, fiction novels and non-fiction books, essays, etc. Which is the most challenging for you to complete? Which if any provides you the most enjoyment? Well, the longer the book form, the longer it takes to complete, so novels and book-length non-fiction take the lead on that score. For non-fiction, however, you have to actually go out and research things instead of just sitting at your computer making things up (for the most part), so that is the most difficult for me. That said, I will have my first short story published for pay this spring, and I’m an adherent of the Edgar Allan Poe theory of the single effect in a prose tale, with “no word written, of which the tendency, direct or indirect, is not to the one pre-established design.” That is a different kind of challenge than the sort of commitment you make (usually two years in my case) writing a long work, and it wears you out in a different way, like a 440-yard dash instead of a marathon. You have had a wide variety of publishing credits. How did you start out as a writer and where did you get your first publishing credit? My first publishing credit, other than high school sports reporting that ran in my local newspaper, was an article on jazz I wrote for The Real Paper, an underground newspaper in Cambridge, Mass. in 1978. I remember it took me several drafts over two months to satisfy the editor, and after receiving my fee of $100 I reflected that there had to be an easier way to make a living. Is there a certain topic that you love to write about? Are there topics you won’t write about? In non-fiction I concentrate on jazz, which needs all the support it can get, and African-American music generally. My next article in this area will be a review of a Leadbelly CD for the Smithsonian. On the fiction side I would love to have more time to write P.G. Wodehouse-style novels about the American counterpart to his upper-class twit characters, i.e., WASPs of the Northeast, but since my novel on that subject (Making Partner) didn’t exactly fly off the virtual shelves of the internet, that’s not gonna happen. I actually do write about the topics I won’t write about, but I put them into the mouths of fictional characters so nobody knows my deep, dark secrets. Do you have more projects planned in the future? Any hints? I am close to signing a contract to write a biography of Johnny Hodges, Duke Ellington’s long-time alto sax player. Does your family enjoy when you write about them even if it’s in a fictional sense? To be clear, the characters in Scooter & Skipper bear only minor resemblances to my real family; my wife likes Grey’s Anatomy, as does the mother in Scooter & Skipper, and she’s dubious of many of my most favored notions, but the similarities pretty much end there. As for my kids, they are both males, now adults, and are close in age, but again their personalities don’t match up with Scooter & Skipper, who are an intentional study in contrasts, one an older alpha-male and a younger more sensitive brother. Oh, this looks like such fun! As a former mischievious male child, I must have this book. Knowing your sense of humor Forrest and Con’s sense of humor, I think you and this book will hit it off just fine!